This entry was posted in Just Life on May 22, 2014 by Steve Tilford. I took Catherine’s mom out to lunch today. We went to Panera to have a sandwich and some soup. I am amazed how great of an attitude she has. She is approaching 90 years old and acts mentally like she is in her early 20’s. I can only wish that I have as great a mindset as I get old. Anyway, I started thinking about all this because I was looking in the mirror this morning and thought I saw some of my dad’s face in mine. It was the first time in my life that a thought like that had even crossed my mind. It got me thinking about my father and kind of just kept going. I just asked my brother and it turns out just last night he figured out that I am older now than my father was when he died. The actual out living day was March 25th, 2014. You can go to the Julian Calculator and figure out the number of actually days you’ve been alive. It takes into account leap days, etc. I’ve been alive for 19825 days today. I’m not sure if that seems like a lot or not. But, I don’t want to die now. I don’t have a whole lot of regrets in my life, but one is that I wish I didn’t treat my parents as they were old when I was younger. I don’t really feel that old. Not close to as old as I perceived my father to be when he was alive. Time seems to move differently as I age. To me, a day goes so quickly now. Today was the last day of public school here in Topeka. 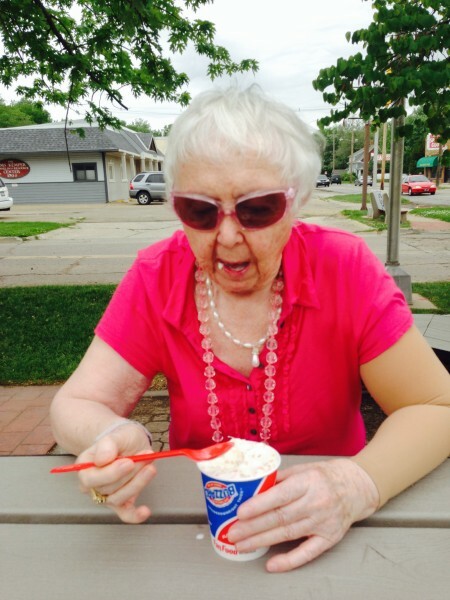 After Catherine’s mom and I went to lunch, I took her by Dairy Queen to have a Hawaiian Blizzard. There were two kids getting sundaes there. Their father told us it was the first day of summer vacation. When I was in elementary school, summer break was sooooo long. I remember it being forever and then I’d ask my mom how much longer it was and she said it was only half over. I could cram so much stuff into each and everyday and then do it over and over again. Now the days fly by. I can blow a week in no time at all. I’m not sure why I perceive time so much differently, but it is a fact that I do. My grandmother lived to 99. If things keep going the way there are, with time accelerating, days are going to be blinks of my eye. 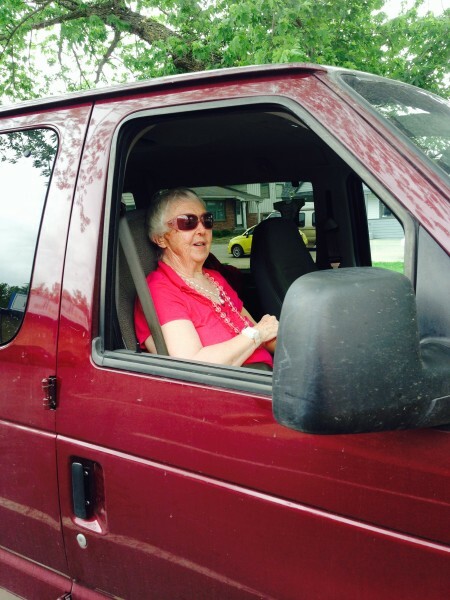 Catherine’s mom, Berta, in my van. I caught her here at DQ, off guard. I am convinced that ice cream keeps old people alive. My grandma has to have a pint of Braums ice cream in the freezer at all times so she can make her nightly ice cream cone. Keep giving her those blizzards! F**k ! According to the Julian calendar calculator, I likely have at best 12.000 days left on the planet if I have a long healthy life from here.. I probably have to work about 3000 of these. That leaves maybe about 7500 more riding days only. Depressingly low numbers. I’ve thought about this a lot the last 10 years or so as well, Steve. Days, weeks, months, and years just go by in a flash now and when I was a kid, summer break seemed endless, as did each year in school. I’m not sure if it’s because our lives are so busy as we get older, or if it has more to do with the fact that we have lived longer so another day is a smaller % of our life and life experiences, thus, doesn’t seem like much as they go by. Whereas a 10 year old has lived so much less, each day is a greater % of their existence to that point and thus feels longer and more important. I befriended a couple that are 70 (I’m 31) last year and make sure I visit them a couple times a week because there is so much to learn from those that are older/wiser than us. They’ve made a point of talking about this too how time goes by faster the older you get, to cherish the time I have with my kids because before I know it they will be grown up and out of the house, that life simply goes by too fast. Take the time to smell the roses, or as I like to say, take the time to look up at the stars. Love it! Buried my mom, a few years back at 89 years old, WWII Army mash nurse, Africa campaign, then Europe, who then lliberated concentration camps, patched up GIs, etc. Man she had a sweet tooth! I’d bring her chocolate in the Alzheimer’s ward, to be sure! Bob hit the nail on the head about the perceived rate of time passage as we age. In an effort to keep the passage of time constant I have ridden the bicycle each of the past 11,316 days without a miss (662,000 miles).